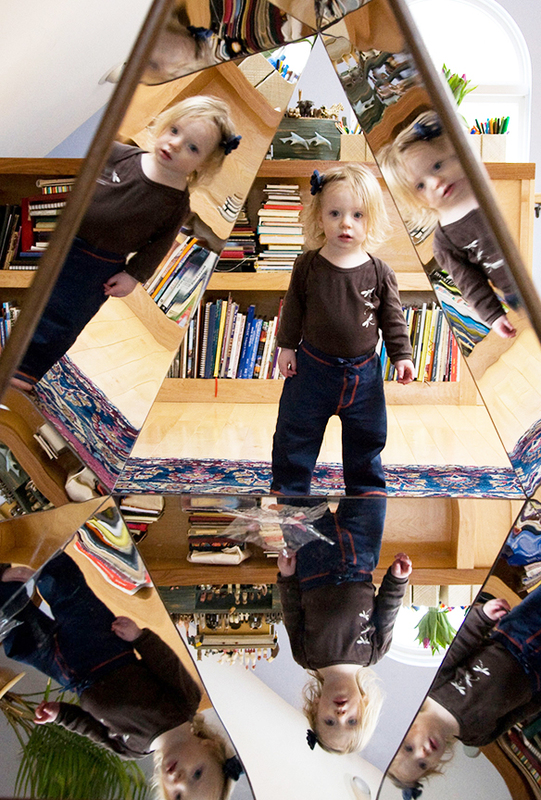 For AC’s first birthday, I worked with a furniture builder to construct a triangular prism with mirrors on all three interior sides. (The concept was invented in Reggio Emilia, Italy.) When you climb in, you see yourself multiplied and the world made fantastical. 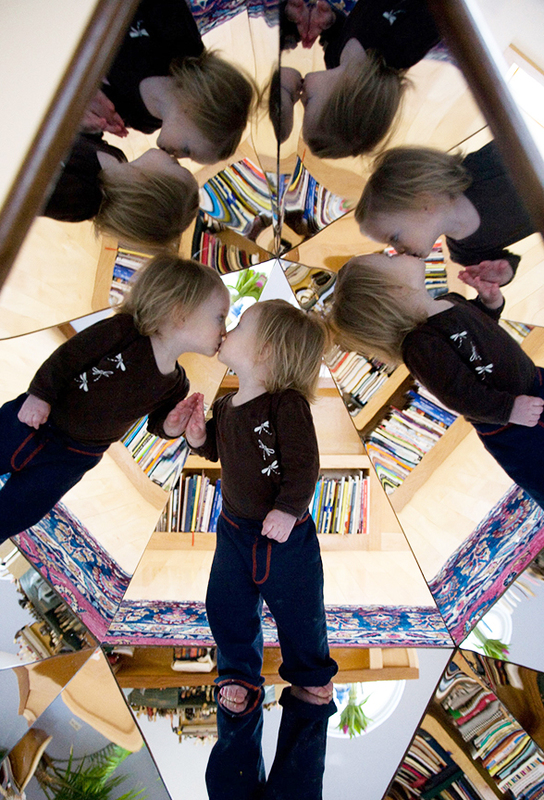 I could barely wait see her expressions of glee when climbing into this human-sized kaleidoscope. The day finally arrived when it was completed and we brought AC up to my studio for the big unveiling. She took one look at it and toddled the opposite direction. Odd. What are you doing, I thought. The excitement is inside the prism. You are going the wrong direction. So, I gently lifted her next to the prism. I could feel her little body begin to tremble. She was alarmed. At this moment I realized she may not know the mirror was okay to step on. I had never thought about a one year old’s perception of mirrors. What I considered thrilling could in fact be downright terrifying. To her, it looked like infinity, and I was asking her to take a step into a never-ending abyss. Some gift. Thanks Ma. I assured her it was safe to walk on, however she did not have to go in it until she was ready. We sat there together for some time as she considered what to do. Then she went to get her trusted companion and tossed him in the prism… you first. She watched as he didn’t fall through space. We stared at him for awhile. He seemed okay. She wasn’t convinced. She cautiously retrieved him, making sure to keep her weight on the floor, and then headed for the stairs. The next day when we went to the studio, the prism was still there, yet long gone were my expectations of a joy filled child receiving the best gift of her young life. Instead, I embraced the fact we’d given her something to confront. In some profound way, the prism had become a right of passage. A monumental discovery. A test of courage, faith, trust. She had to learn for herself that some times our perceptions are not reality. I positioned myself on the other side of infinity, and smiled. You can do it, my love. Whenever you are ready. You are totally safe to take that big step. I’m right here. And then something inside of her clicked, an internal impulse said go. She grabbed hold of her courage and took a huge risk. She stepped into perceived infinity and discovered she was standing on her own reflection. The first thing she did was give herself a kiss, and I burst into tears. 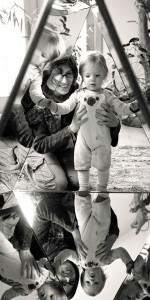 It took awhile for AC to enjoy the mirror house as I had originally intended. But those beginning encounters with the prism are precious to me, as they serve as a continual reminder – often what seems ordinary to us, such as a mirror, is quite extraordinary for young children. How fun to go back and remember this rite of passage with you and AC. 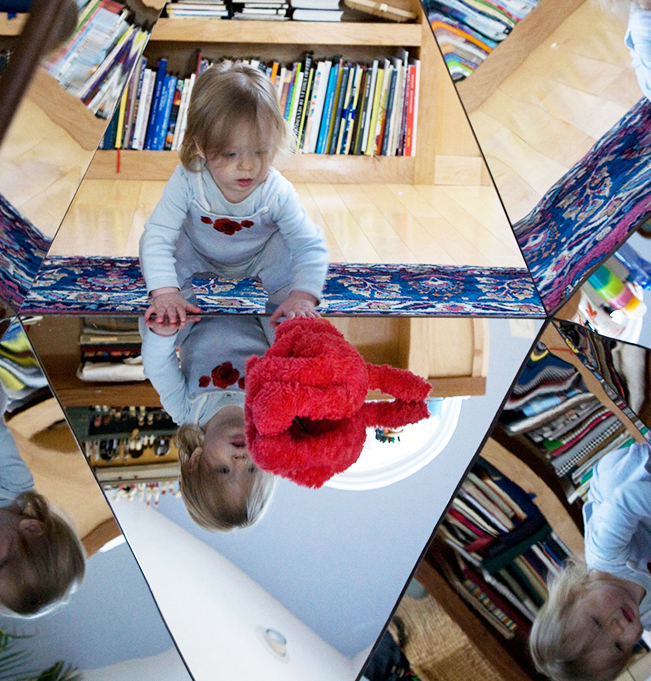 I’d love to use one or two of your child-in-kaleidoscope photos in Part 6 of my book, which you can read for free on my website. I’d give you credit on the photo credits page. I hope you’ll want to do this.